APIA - Climate change stories rarely make front page and breaking news in the Pacific, at least not locally generated news items. But all that could change, with more investment by environmental organisations into the specialised training of journalists with an interest in climate change. This week Journalists from 13 Pacific nations have been participating in a training by the Secretariat of the Pacific Regional Environment Programme in partnership with World Wide Fund for Nature (WWF). Climate Change Advisor for SPREP, Mr Espen Ronneberg says the media plays an important role in climate change awareness. Ronneberg says an informed media can also inadvertently contribute to decisions in the negotiation level. 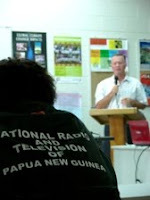 Participating Journalists come from Solomon Islands, Nauru, Tonga and hard hit Kiribati and Tuvalu. Samoan Journalists are also taking part in some activities. Spearheading the training is Award winning environmental Journalist, Samisoni Pareti from Fiji. Pareti was recently appointed the European Union Pacific Media Advisor is co-training the workshop with SPREP Media Officer, Ms. Nanette Woonton. Woonton says the workshop is to help Pacific islands media to have a better understanding of climate change as well as other environmental issues. She says that climate change is an extremely significant issue for the Pacific region. “We hope to provide Pacific media with the right tools so they can report on this issue which in turn will spread awareness and information,” Woonton said. Woonton believes that there is a need for training in the area of climate change reporting. She said that the overwhelming number of applications received for the training from throughout the Pacific region indicated the strong interest from regional Journalists. The training ends today after weeklong sessions on the best practices of reporting on climate change.